Well, as you can see, I'm officially back from vacation! I had a wonderful time and will explain more on Monday. For now, I'm taking part in Mocha Memoirs Press's Fall Into Horror promotion. The entire promo is to not only help promote great indie authors, but to help readers find new, chilling stories for the upcoming month. I'll be jumping around all sorts of blogs, so be sure to keep your eyes peeled. 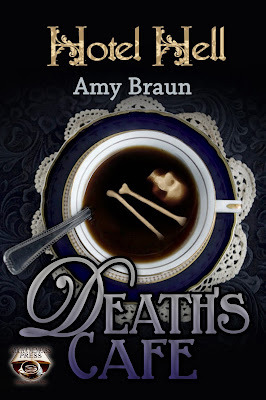 So to kickstart the event, which includes a Rafflecopter giveaway, I'm going to be welcoming to the blog author Carole Ann Moleti to the blog where she can share her thoughts, and a snippet of one of her horror stories! 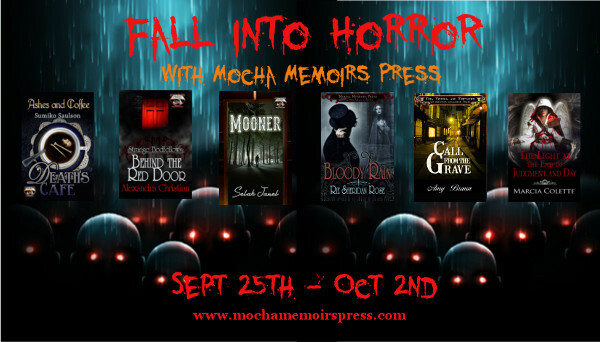 Mocha Memoirs Press is celebrating the new Fall season by showcasing their love of horror and the authors who write it. Please welcome CAROLE ANN MOLETI as she shares her thoughts on fall and horror. The Ultimate Test was the first horror story I've ever written. My long term critique partner, supernatural horror writer Andrew Richardson, gave me a tremendous amount of support and encouragement. I scared myself by embracing all those dark thoughts. Since then, I've dabbled on the dark side with "The Dhampir's Kiss" in Bites: Ten Tales of Vampires. And my novel in progress Boulevard of Bad Spells and Broken Dreams is a very dark urban fantasy heavily based on Santeria. "Mishmash Magick" in Beltane: Ten Tales of Witchcraft and "Dance With the Devil" in Seers: Ten Tales of Clairvoyance are short excerpts of Boulevard adapted to a short story format. I have a great deal of difficulty reading horror, probably because I have to escape from what I see so much of in real life. I've ridden ambulances and worked in the ERs of many of hospitals in The Bronx, Harlem, and Washington Heightsâ€”some of the most violent places in New York City. I've been out on the streets and in the botÃ¡nicas both working and doing ethnographic research, immersing myself in normal, everyday activities and places to absorb the essence of the experience. I'll leave you to figure out what's real in my stories and what's not. So, now it's time for you to share your reasons for reading, or not reading horror. The sweet, floral essence of magic swirled through the botÃ¡nica. Candles flickered in front of a riot of statuary. "Muy buenas, mi amor." A shriveled woman hoisted herself from a chair in the corner and hobbled over. "Hola, SeÃ±ora." Aramis handed over a list of the herbs she needed. "Â¿Tu eres santera?" The woman's gnarled finger traced down the list. Her eyes narrowed to read the tight English script. "No. I study herbology. Las plantas." "One who use these do more than study, mi amor." The lines in the crone's face deepened with a broad smile. "Una bruja, tu estas." "Not only witches use herbs." If she associated with anyone who practiced The Craft, they would all be subject to discipline. Memories of wise women being brutalized and dragged from their homes tickled her brain. "No ten miedo, mi amor. I no tell. Las santeras help las brujas. Somos hermanas. Sisters." She gestured Aramis into a chair and lowered herself into a seat. Her attention focused on a bowl of cloudy water beneath the icons. She picked up Aramis' hands rubbed the palms. "Vengeance. You seek vengeance." "Yes." Aramis followed as the woman wandered around the shop collecting several packets and tiny brown bottles. A pencil scratched as the santera totaled the order on a scrap of paper. "To aid you, burn this candle until it's done, then return to me so I can finish it and give you further instructions. $75.00." Aramis took the black jar. The wax pillar inside swam in murky liquid that bubbled at her touch. She left a $100.00 bill on the counter. 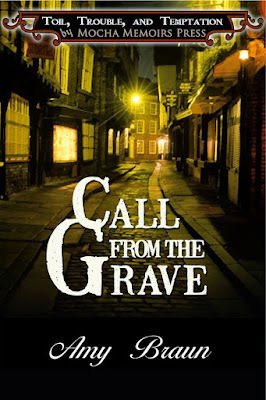 Carole's work has appeared in a variety of literary and speculative fiction venues. Short stories set in the world of her novels are featured in several of the Ten Tales anthologies and the Toil, Trouble and Temptation Anthology at Mocha Memoirs Press. The Widow's Walk, a Cape Cod paranormal romance, was published by Soulmate in 2014. The prequel, Breakwater Beach, is due out in early 2016. Mocha Memoirs Press, LLC is a genre-oriented publishing company. Their vision is to provide an outlet for outstanding speculative and romance stories that often fall beneath the radar of traditional publishing houses. They seek to provide quality stories that invigorate the reader’s literary palette like a good, strong coffee. Like great coffee houses, they offer a variety of flavors. They publish stories in the following genres: science fiction, fantasy, horror, and romance, including the sub-genres of steampunk, cyberpunk, diesel punk, alternate history, weird westerns, and mash-ups. And that's day one! I'm really excited about this event and am happy to be part of it. Thanks for having me, Amy! See you on the Hop! Good morning all. Remember this event goes for an entire week. For every five comments on this blog, I will be awarding an ebook of The Ultimate Test using random.org. So comment early and often.